Feels like I’ve been away from the blog for weeks! Alas, it has only been but a day or two. I’ve been busy with getting some work done around the house and trying to get ahead of the backlog that is starting to pile up at my day job. On the positive front I was able to get a loop in at my favorite hill training course (Springdale Cemetery). It has been awhile since the weather cooperated and finally got a chance to run with Ryan to see how our legs fared over the holiday break. Pretty happy where I’m at, but need to start ramping up the mileage to be ready for the race season that starts in April. If things keep going as planned, I should have no problem being ready for back to back 5K and half. What I am little concerned about is finishing my current race against none other than Father Time. Will be coming down the wire to get all my Texas birding posts outs. Let’s not waste any more time getting to that task. Welcome to the blog, the newest bird in my list. 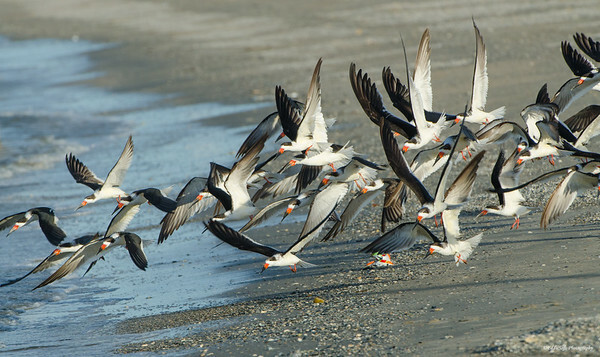 Hit the jump to see and read more about the Skimmers! … or more likely a large number of them hanging out in a sizable colony. I would say there were close to 50 hanging out in this flock. We encountered these by accident while visiting Galveston Island, Texas back in January 2017. You probably remember, this was the second of three trips we have taken down along the Texas Gulf Coast. On our first trip, I had all intentions of adding this awesome bird to my list based on reported sightings and reference books. Having completed that first trip without success, figured I was duped by malicious lies scheming to get me to come visit the area. Clearly from the shots provided in this post, the second attempt was far more successful bringing a personal apology to those bird spotters I might have cursed under my lips. Ironically, Linda and I were standing on the coast at the exact spot we were the visit before. There is a small pond on the right side of the main road that runs through Galveston – believe it is pretty far on the south end of the island. Wish I could remember more details to help locate it for you, but we get there more by feel now than actual directions. I do remember there is a road that goes to the right at the end of the pond – that road takes you out onto the beach. In case you are wondering we added the Roseate Spoonbill on that beach back in November 2013 (link here). Not much had really changed in the location. There were a number of birds in the area most of which I already had with the exception of the Marbled Godwit posted previously (link here). Just about to call it a day when a black and white mass came darting overhead. Unbelievably lucky. Moments before throwing in the towel for the second straight attempt, the birding gods took pity on me. Being the first time ever witnessing them in the wild, I had no idea how fast and agile they were in the air. Thanks to the recent trip to Texas, I now officially put Cave Swallows at the top of my hard to photograph bird list. These Skimmers are not that far down the list. With the Cave it is just their speed and sporadic path that make them difficult to get a bead on especially with The Beast. 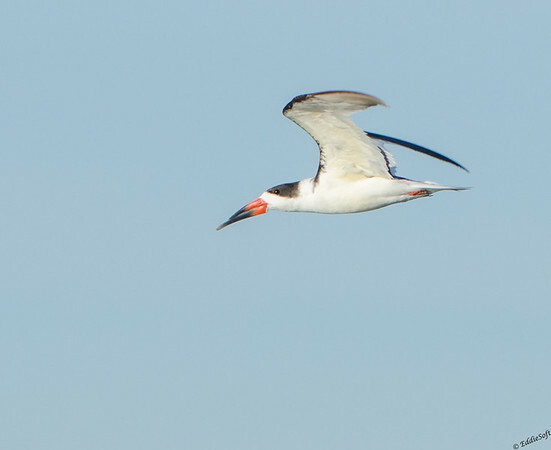 When it comes to Skimmers it is more trying to figure out what to focus on when they’re in the air. Although, on the ground not so hard ha. “The shoe is the sign! no, follow the gourd for that is truly the sign, no it is clearly the chip bag – all hail the holy chip back of Jerusalem!” Yes, was a bit annoyed when I noticed that back in digital darkroom. I could have easily removed it, but thought it was funny – not sure why Life of Brian popped into my head. The funny part is I looked at that picture for a long time contemplating the bag and didn’t even notice the “one not like the others”. I must say, a very inclusive group. These Skimmers have a very uniquely hinged bill that allows the lower mandible to be dropped into the water (skimmed) and then snapped shut when it comes in contact with something. Sorry to say, I have no pictures of them doing that, but do have the hilarious picture above of two of them doing an imitation of a land shark – much to the enjoyment of the others. What I wasn’t prepared for is the front on view (see above shot). Looking through the glass, I couldn’t tell what happened to this one’s bill. Like some bad gotcha nose joke, it was GONE. After investigating the shot and then doing some field research on other specimens, it became clear that there was no trickery going on. 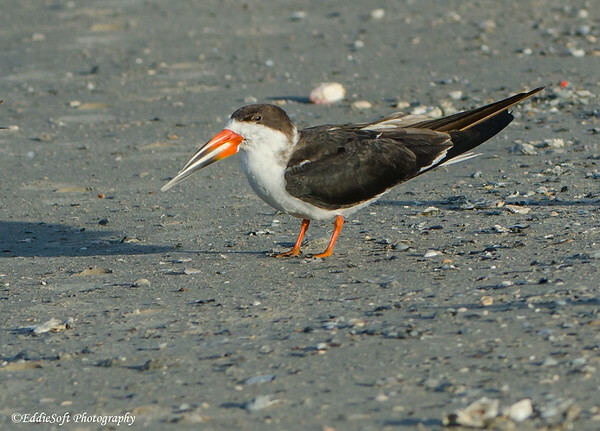 The Skimmer just has a supper thin bill – “One wauffer thin bill”. For some reason have Python on the brain today. The flock didn’t stand around too long. 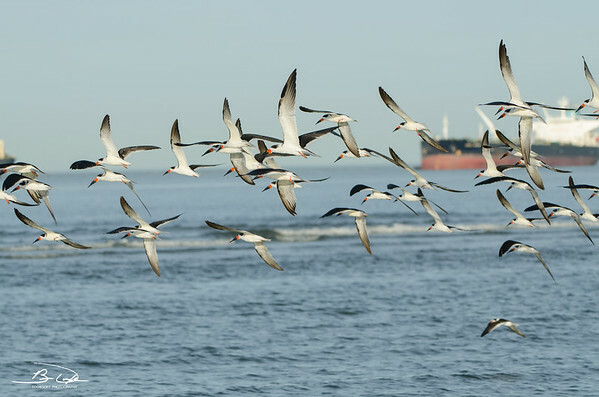 As if a silent dog whistle was blown, the Skimmers took flight and headed out over the water. This is where you will understand my focus problems alluded to earlier. So much activity, not sure which area to focus on – opted for somewhere in the middle. Did I mention they were pretty fast and you can see they prefer to hang close to each other. I am probably going to have the next shot printed for my room. It is the singular shot that reminds me of that part of Galveston Island. Cool birds, the wide open water, some [not that] tasty waves and tanker ships passing through. Just missing a chip bag somewhere in the shot hehehehe. 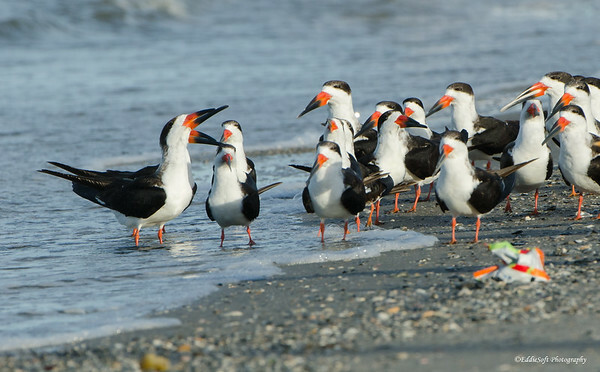 Truly enjoyed being able to stand on the beach and just watch them go about their business. They would essentially turn as one as if some hidden signal was directing them from the shoreline. For those of you who have had to run suicide lines in sports, you probably just cringed at the thought. On whistle, go, on whistle run back, on whistle run to next line – never puked when I had to do them, but awwwwfully close on several occasions. These Skimmers were in superior shape gladly supporting the random direction changes. On reflection, maybe they were just trying to fatigue my arms while trying to photograph them. By the time I called it a shoot, my arms were jello form jerking the big glass up and down, left and right. 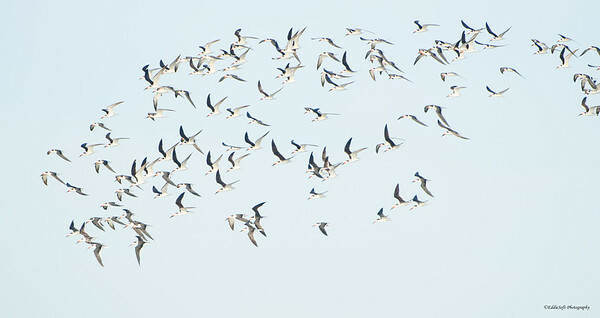 Based on the shot below, might have to revise my guesstimate on number birds in the flock. I was able to get some isolated shots to help show the key details of the bird. 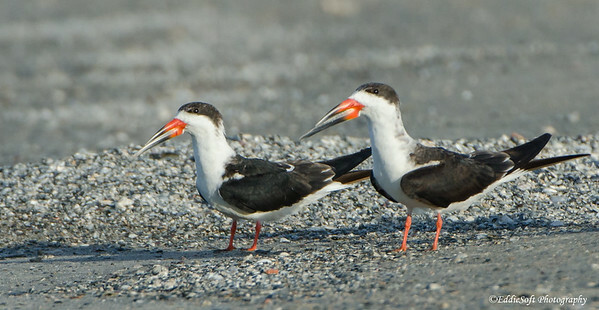 Their long bill, bright orange bill base and the tuxedo feathering make this bird and easy ID in the field even before they open that incredibly unique lower jaw. 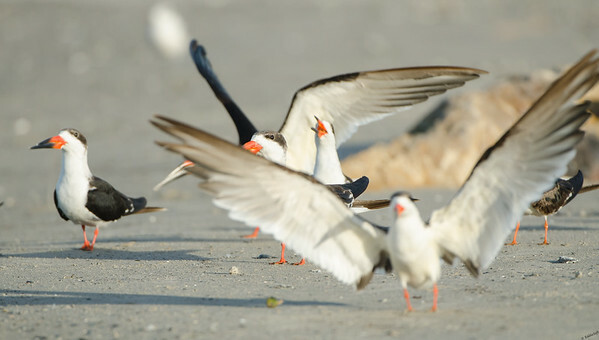 You can see some of the resemblance to their Gull and Tern cousins with the eye patch and the white underbellies. Being a new bird, let’s see what other wisdom I can bestow about this fast food aficionado. 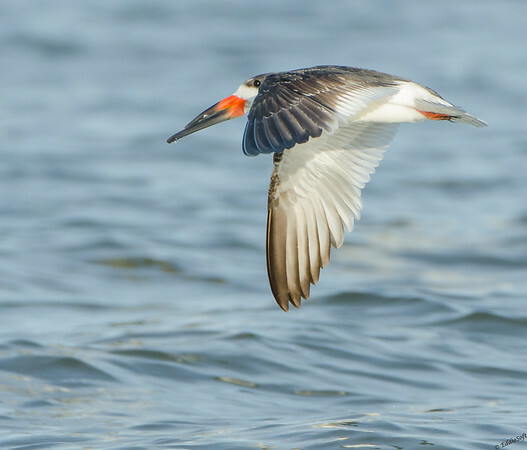 First off, the Black is the only Skimmer in North America. They are active during the day (case in point here), but they are more crepuscular, which is a super technical word intended to impress you and make myself sound like an authority … did it work… thought not – simply means active in the dawn and dusk if not nocturnal portions of the day. Since they are feeding by feel anyway, having a light is not a necessity. They are a colony bird and notorious jokers always photobombing unsuspecting photographers. Well, I have to sign off now. Today was a big day for us as Linda and I were asked to put our love of nature and photography towards an exciting volunteer opportunity. Should be fun and educational – my favorite combination.